In order to test general relativity further, we need to find a pulsar orbiting something really massive – a black hole for example. These systems are expected to be very rare, but with the unique sensitivity of the SKA we expect to be able to find them in the disk of our Galaxy. We may also find pulsars in orbit around the super-massive black hole in the centre of the Galaxy. To test Einstein’s theory of general relativity further, we want to find a pulsar orbiting a black hole. By studying the regularity of the received pulsar ticks we can not only test general relativity under very strong-field gravity conditions, but we can also study the black hole properties at the same time. 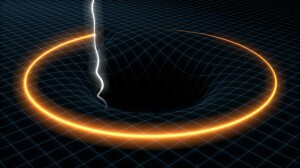 General relativity makes clear predictions about the nature of black holes. Observations with the SKA can measure these properties and hence provide the ultimate test for general relativity. Finally we will know whether Einstein was correct in his description of the nature of black holes and space-time in the presence of strong gravitational fields. What is a pulsar and how do they relate to black holes? Pulsars, discovered in the late 1960s by PhD student Jocelyn Bell, and her supervisor Anthony Hewish, are the fast spinning remnants of stars that have exploded, leaving behind just the gravitationally collapsed central region, which is typically only a few kilometres wide. It is a super dense object comprised of neutrons, that a teaspoonful of would weigh trillions of kg. Black Holes take this concept even further; with a core collapse of larger stars after they have exploded in a supernova, to sizes and densities so extreme that not even light can escape their gravitational forces. It is believed that the centre of our, and many other galaxies contain super-massive black holes.